Giant and CCC Team joined forces at the start of the 2019 season. Both organizations have a long history of competing at the highest levels of competitive cycling, producing world champions, Olympic champions and winners of major classics, monument races and grand tour victories. The 2019 CCC Team squad features 24 riders representing 12 nations. The team is led by 2016 Olympic champion Greg Van Avermaet and features grand tour stage winners Alessandro De Marchie, Simon Geschke, Serge Pauwels and Francisco Ventoso. Team riders have a full quiver of Giant bikes to train and race with, including the TCR Advanced SL, Propel Advanced SL and Trinity Advanced Pro TT bike. Beyond the bikes, CCC Team riders also play an important role in helping Giant develop pro-level products including WheelSystems, cockpit components, helmets, GPS computers, saddles and other gear. Van Avermaet Keeps the Podiums Coming as Classics Season Heats Up! 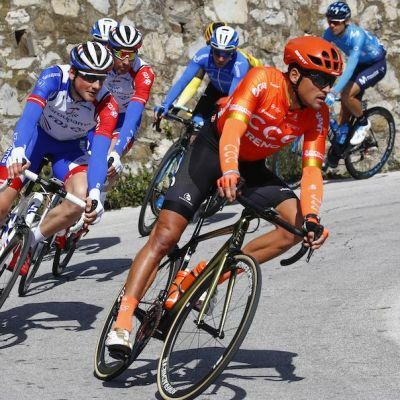 Van Avermaet Sprints to Podium at Tirreno-Adriatico! Van Avermaet Sprints to Omloop Het Nieuwsblad Podium!